Running Arrow Farm LLC is a stocking dealer for the below products that we use everyday with our horses and cattle. We now have the "TOTAL PEOPLE PLUS" Multivitamin in stock. We keep the "Total Equine", Remuda Minerial Tub, and the Longhorn mineral tubs (both 2% and 32%) in stock here at our Farm, but please call ahead to schedule a pick up. Bill has a severe hearing problem so call Sandy so she can relay to Bill what is needed. That way Sandy is able to have your order ready for your pickup as the feed bags/mineral tubs are too heavy for Bill to handle. Also available per special request only: TOTAL BULL, TOTAL LAMB, TOTAL GOAT, and TOTAL DEER. NOTE: in CLARENDON there will be a "TRADE DAYS". They are looking for vendors (crafts etc.) for their monthly 2 day event. Contact Kimberly Britten at 806.206.6815 to sign up. NOTE#1: I have gone back to my late fall/winter/spring schedule of 1 time per month of stopping in Childress, Sayre, Elk City, Clarendon or Borger. Altus will be 4x per month. You may buy one bag of feed, or a ton worth of feed. The horse feed is packaged in 40 pound bags, but it is fed at a rate of 4# per 1000# horse. 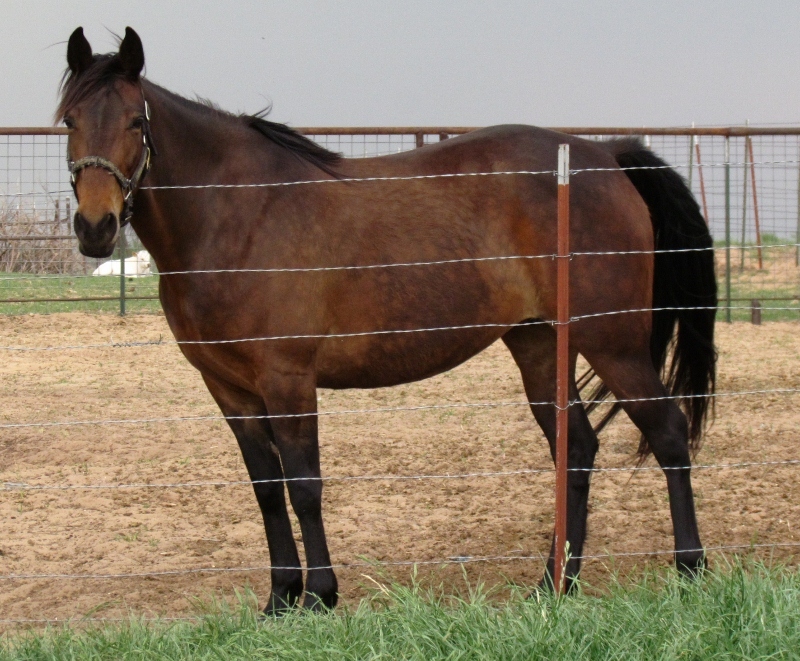 As "Total Equine" is a complete feed, it is possible to feed it without hay if necessary. Total Equine is nutritionally balanced so you don't need to add supplements. NOTE: It is permissible to feed horse feed to cattle.. but due to the different nutritional requirements for bovine and equine, it is NOT recommended to feed cattle feed to horses. Note: We do not have the Tasco Product in stock, but will be able get the Tasco for you provided we have advance notice that you wish to purchase it. BioRemedies is a Limited Liability Company. It is owned and operated by R Harry Anderson, PhD. NOTE: Due to Dr. Harry moving to Texas, his company is now known as: "Total Feeds Inc."
Besides his formal schooling, Dr. Anderson has been in the livestock business from his childhood on a dairy farm in North Dakota to the present. His many years as a corporate employee within the livestock industry and his extensive and on-going field work as an independent consulting nutritionist have allowed him to develop a philosophy of better animals through better nutrition. The products sold by "Total Feeds Inc." are either designed by Dr Anderson or are compatible with his commitment to quality and positive results. Dr. Harry Anderson PhD., formulates and sells only natural and environmentally sound products to promote maximum productivity in all species of animals. Content copyright 2013. TOTALFEEDS.COM. All rights reserved. was developed from science and experience and first produced in 2000. The nutrient levels are based on what has been learned by scientific research over the last 40 years. The physical form of extrusion and the specific ingredients are what horses, mules and donkeys need to maximize health, attitude and performance. small intestine whereas most of raw or pelleted starch is digested in the ceacum and/or large intestine by fermentation. processed starch. Improving the digestibility not only improves starch digestion, but also improves digestion of the fiber and improves bioavailability of minerals and micronutrients. Total Equine® contains Tasco® which is a specific species of seaweed by the name of Ascophyllum nodosum. A. nodosum contains high levels of Fucoidan and Fucose sugar. Fucoidan is a sulfated, short-chain polysaccharide that is known to stop growth of E. coli in the large intestine. It also controls other pathogenic bacteria that inhabit the large intestine. Alfalfa Hay, Corn, Parboiled Rice Bran, Soybean Meal, Wheat Middlings, Roughage Products (10%), Dicalcium Phosphate, Magnesium Oxide, Diatomaceous Earth (and inert carrier and anti-caking agent), Calcium Carbonate, Salt, Monocalcium Phosphate, Dried Kelp Meal, Manganese Amino Acid Chelate, Zinc Amino Acid Chelate, DL-Methionine, Biotin Supplement, Vitamin E Supplement, Copper Amino Acid Chelate, L-Lysine Monohydrochloride. Zinc Hydroxychloride, Manganese Hydroxychloride, Copper Hydroxychloride, Ascorbic Acid, Niacin Supplement, Thiamine Mononitrate, D-Calcium Pantothenate, Yucca Schidigera Extract, Sodium Selenite, Vitamin A Supplement, Menadione Sodium Bisulfate Complex, Pyridoxine Hydrochloride, Vitamin B12, Supplement, D-Activated Animal Sterol, (A source of vitamin D3 activity), Ferrous Carbonate, Cobalt Carbonate, Ethylenediamine Dihydroiodide and Folic Acid, Lactobacillus acidophilus Fermentation Product Dehydrated, Lacotbacillus casei Fermentation Product Dehyrdated, Bifidobacterium thermophylum Fermentation Product Dehydrated, Enterococcus faecium Fermentation Product Dehydrated. A Simple, Convenient Method For Supplementing All Horses. Would you Like your horses to be healthier? Are you your own nutritionist? Do you want your horses' hair and coat to be naturally shiny? Does your horse have a bad attitude? Now there is a simple answer! Remuda Tub-10 VMA is designed and formulated to be self-fed to horses of all ages and activity levels to provide protein, minerals and vitamins. 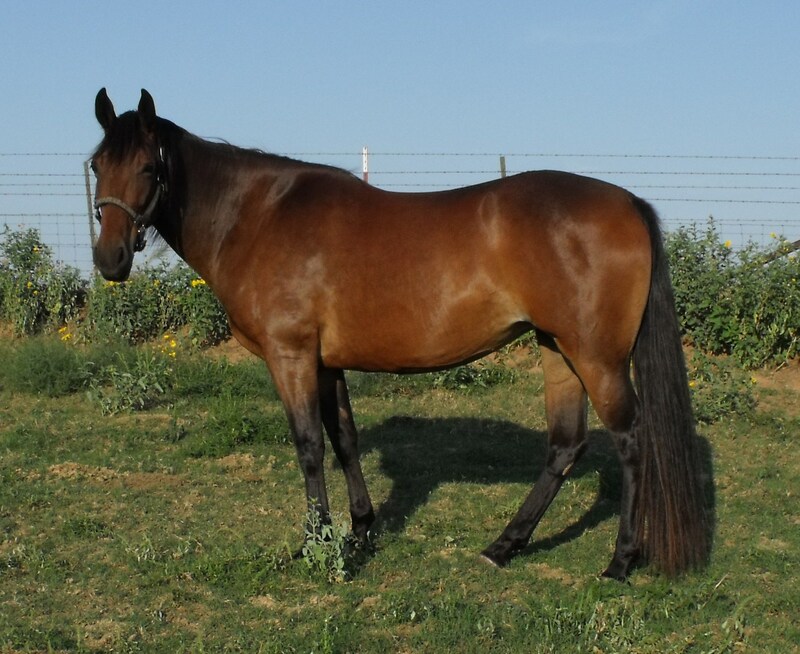 It is to be fed with adequate forage and grain to meet the majority of protein and energy needs of the horse. This filly was foaled by a mare that was on the Remuda Tub throughout gestation and had access to the Remuda Tub all her life. At 13 months of age, she is taller than either of her parents. Below: Same filly but now at 5 years of age in early summer. Contains calcium, phosphorus and magnesium to balance the hay and grain portion of the ration. Insures bone health and joint health and growth. Increased bacterial growth in the hind gut an improved fiber digestion. Improves digestibility of hay and grain in ration by increasing bacterial digestion in the hind gut and in the fore gut due to type and level of B-Complex vitamins. Reduced total feed requirement for maintenance and all levels of activity. Increases the energy available from the amount of feed that a horse can consume in a given period of time. When the horse requires more energy, it can consume more feed because it increases the rate of passage. Horse will not tire as quickly, will stay strong longer and recover from work more quickly. Contains Amino Acid Complex forms of Copper, Manganese and Zinc. Insures the maximum biological availability of these critical elements for immune function and hoof health. Contains Methionine, Lysine, Biotin, Copper, Zinc and Iodine in the proper ratio to maximize health, hoof integrity and hair growth. Maximized hair growth, increased hoof growth rate and health and insures a strong immune system. Improves the immune system, controls gram negative bacteria in the gut, and improves blood flow. Horse will not lather as much during hard work and will cool down more quickly. Reduced fly population around stables and in pastures. Reduced odor of manure and urine and improves feed utilization. Contains Choline at correct level. Improved attitude and focus of the horse at work. Copyright © 2008 BioRemediesLLC Garden City, KS. All Rights Reserved. BioRemedies Longhorn Mineral Tub is formulated to provide the essential nutrients for maximum health, muscle and horn growth and reproduction. Ingredients used in BioRemedies Longhorn Mineral Tub are of the highest quality and provide excellent bioavailability of nutrients to the animal. A Convenient Method Of Supplementing Longhorn Cattle To Provide The Nutrients Essential For Health, Muscle And Horn Growth And Reproduction. Major Minerals Calcium, phosphorus and magnesium are critical minerals for growth, reproduction and lactation. They are required in specific ratios for maximum performance. Under normal conditions BioRemedies Longhorn Mineral Tub is formulated and manufactured with only the most palatable and biologically available ingredients. The ratios of calcium, phosphorus and magnesium are formulated to balance most grass and hay conditions. Trace Minerals Trace minerals act as catalysts for most chemical reactions in the rumen and in the animals body. All feedstuffs contain trace minerals, but the levels are variable and the bioavailability of each is not well known. Inadequate trace mineral intake can result in slow growth, low reproductive performance, and inadequate immune function. BioRemedies Longhorn Mineral Tub is formulated to meet not the minimum, but the optimum level of trace minerals for maximum performance. To insure adequate bioavailability, BioRemedies Longhorn Mineral Tub contains a minimum of 20% of the copper, manganese and zinc as Amino Acid Complexes. Vitamins act as antioxidants to reduce cell aging and destruction from products in the environment and metabolic by-products. Vitamins A & E are at levels in BioRemedies Longhorn Mineral Tub to provide adequate antioxidants to maintain good health and immune function. BioRemedies Longhorn Mineral Tub also contains dried kelp that is known to have strong antioxidant properties. Because horn growth is critical to success in the Longhorn industry, BioRemedies Longhorn Mineral Tub is formulated with a special combination of minerals and vitamins and amino acids. Horn growth depends on the correct levels and ratios of minerals, vitamins and amino acids. When the minerals calcium, copper, iodine and zinc; Biotin; and the amino acids methionine and lysine are present in the correct levels and ratios, horn growth is maximized. Offer BioRemedies Longhorn Mineral Tub free-choice when adequate grass or other roughage is available. Estimated intake of BioRemedies Longhorn Mineral Tub should be approximately 0.5 to 1.0% of the total dry matter intake of the animal. One 50 lb. tub for every 15 20 mature animals or every 25 30 newly weaned animals. One 65 lb. tub for every 20 25 mature animals or every 35 40 newly weaned animals. One 100 lb. tub for every 30 35 mature animals or every 40 - 45 newly weaned animals. Cane Molasses, Soybean Oil Meal, Urea, Dicalcium Phosphate. Monocalcium Phosphate, Calcium-Magnesium Carbonate, Dried Kelp Meal, Formate Salt, Cobalt Chloride, Copper Sulfate, Copper Amino Acid Complex, Manganese Sulfate, Manganese Amino Acid Complex, Zinc Sulfate, Zinc Amino Acid Complex, Sodium Selenite, Biotin, Vitamin A, Vitamin D, Vitamin E.
Content copyright 2009-2011. Bioremedies LLC. All rights reserved. A seaweed derived supplement that is used in many of our products. "Tasco is a functional food designed to address some of today's production issues in the beef industry. All-natural Tasco, helps modulate functions in the animal relevant to health, productivity and stress resistance. University research and commercial trials have demonstrated that cow/calf, starter cattle and feedlot operations can benefit from a feeding program that includes Tasco."